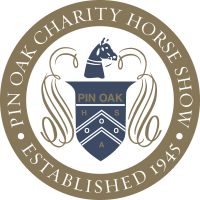 Katy, Texas – March 21, 2019 – The 74th Pin Oak Charity Horse Show is underway, and what a great way to start off the spring season! A USEF Heritage Competition and NARG top 25 Horse Show, Pin Oak offers daily hospitality, hundreds of thousands of dollars in prize money, bonus awards, and trophies over three action-packed weeks of competition for the benefit of the Texas Children’s Hospital. 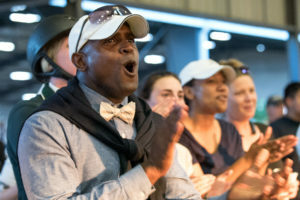 With all it has to offer, the Pin Oak Charity Horse Show is the place to be this spring for many of the country’s top riders. The first Championship of Pin Oak 2019 was secured by Jennifer Alfano and Rhapsody, owned by Sharon O’Neill, yesterday morning in the Baby Green division. Later that afternoon, Will Emblazon, owned and shown by Rachelle Goebel of Montgomery, Texas won the Hunter Breeding 3 Year Old and earned the Best Young Horse Championship. The Oldenburg (Willemoes–Anastazia) was bred by His Cat Farm and has been brought along by Rachelle and her sister, Felicia Carroll, since Rachelle bought him as a 5-month-old. Will Emblazon has competed at Pin Oak every year since he began showing as a yearling. 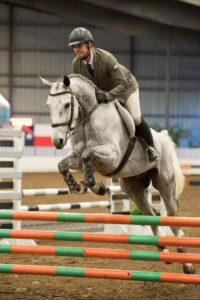 He remains undefeated in 2019, winning both the Hunter Breeding 3 Year Old and Best Young Horse at all four weeks of the 2019 Great Southwest Winter Series. 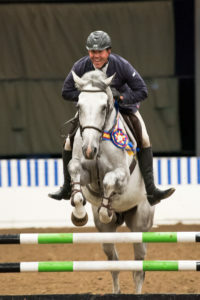 Liza Richardson showed Olde Oak Farm’s Infinite Shine to the Best Young Horse Reserve Championship. Courtney Lenkart of South Haven Farm had a tremendously successful start to Pin Oak 2019 winning all of the first day’s 3’3” Green Working Hunter classes on Wesley Clingman’s Deluxe. 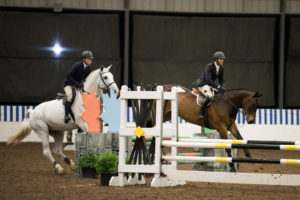 She then continued her winning ways earning blue ribbons on South Haven Farm’s Snickers in the 3’0” Green Working Hunters, Lori Mathews’ Alisto in the 3’6” Green Working Hunters, and Emma Flett’s Cascalo in the 3’6” Performance Hunters. In the jumper ring, we caught up with Briley Koerner, one of the 2019 Faces of Pin Oak and winner of Pin Oak’s 2018 Booth Show Jumpers Under 25 Grand Prix. “My horses were great after having a few weeks off from WEF. I did a 1.25M jumper class today to get my horses in the ring before tomorrow’s 1.45M Welcome Stake,” she told us about her first day at Pin Oak 2019. “I’m so excited for the next three weeks at Pin Oak! 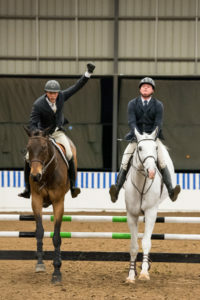 Pin Oak did an amazing job with its set up as always, and it’s great to see this show striving for improvement year after year,” Koerner added. In addition to Thursday’s 1.45M Welcome Stake, exhibitors and spectators can look forward to ‘Derby Day’ on Friday, featuring both a USHJA International Hunter Derby and a USHJA National Hunter Derby, as well as the American Saddlebred competition Championships and the Oasis Petroleum $30,000 Grand Prix and Amalaya Investments Ringside Gala on Saturday. Sports Psychologist Mario Soto is hosting highly anticipated seminars on Friday night and Saturday morning. Pin Oak also offers daily hospitality, including numerous evening ringside receptions, and fabulous shopping – The Marketplace and The Shops at Pin Oak have everything a rider needs to complete their favorite equestrian ensembles from popular vendors such as Fab Finds by Sarah, Saddle Shoppe, Luxe Eq, Equiventure Tack, Quail Hollow Tack, and more. 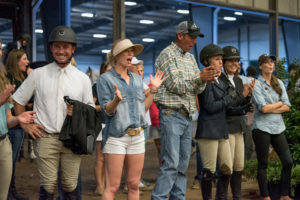 Pin Oak 2019’s American Saddlebred competition sponsored by Bluebonnet Farm also commenced Wednesday evening with the Open Division classes. Exhibitors, spectators, and sponsors enjoyed watching the evening events with food and refreshments at the Saltgrass Steakhouse Saddlebred Exhibitors Ringside Party.